Artificial Intelligence (AI) has been a technology that has been promised to us since the 60’s. If anybody has been paying attention to the movies released in the 80’s by now we should have flying cars and robots to do our bidding around the house. Well we aren’t there yet; however, with the technology improving on processors and memory, AI is becoming a reality. As any sci-fi buff will tell you the biggest concern is what happens when it falls into the wrong hands? The bad news is that it may have already happened. Criminals have found a way to use AI and create what’s known as Machine Learning (ML). Using algorithms, it can query vast amounts of data to discover patterns and generate insights. So what does that mean? Fundamentally, it means the machine can learn from these relationships. As we learned in the last presidential election it is very easy to gain access to emails and intercept them as they are transmitted. These ML’s can read these emails and learn how people communicate and even understand how to properly form sentences and utilize industry terms. With this information it will be able to craft emails and send them to the proper people. So now these phishing emails that we are all used to getting really look like the CEO is asking you to transfer $5,000 to the new Chinese Bank account. Don’t worry and don’t think you need to head to the bank and buy a roll of stamps because now you are done with email. There are things you can do to protect yourself. The first is education. Teach your people how to look for indicators in the email. Does the signature look wrong? Did the CEO spell his name correctly? When have I known him to be up at 3am? The second is to utilize your technology. Are you servers set up to only accept internal email from your internal email server? If you don’t do business overseas, have you set your firewall to block foreign country IP’s? Finally, be suspicious. If the amount of money you are being asked to transfer is enough that if lost would get you fired, make a phone call, do a chat, send a text message. There isn’t an executive on this planet that would fire you from trying to save the company an embarrassing situation…and money! If you’d like to learn more about this and see if you can do anything to minimize your risk, reach out to us. Cornerstone Technologies works hard to stay in front of these kinds of problems, and we can help you do it, too. Remember, Cornerstone Technologies is IT. 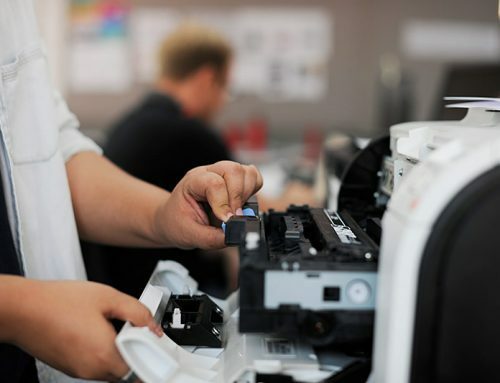 Spring Cleaning – Retire Old Copiers and Printers!